We even published a cookbook!!!! 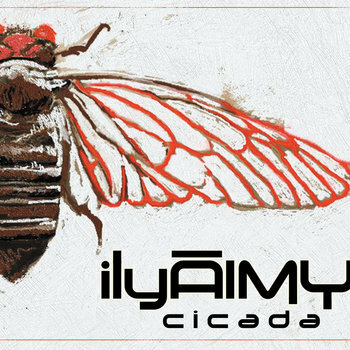 "cicada" is ilyAIMY's 10th album. Released in the summer of 2017 in time to an off-year brood, the album was written (with the exception of the spoken-word piece “Cicada Summer”), recorded and mixed by rob Hinkal. Gordon Nash (Wise Madness) placed cicada on his Top 10 Albums of 2017 alongside the likes of Bela Fleck and Anais Mitchell writing that “Cicada is the oddest album on the list... it's so good … a lightning strike to your nervous system. You are not going to sit still while listening” and calling Natural 20 “the ultimate nerd love song”. "cicada" saw the debut of drummer Joey Jenkins, now making the full band a 6-piece ensemble. Musically, the band stretches its chops and boundaries even further on this album, featuring new instruments, new styles and a few guest artists. Singer/songwriter Seth Horan was especially impressed as the band pushed boundaries. Seth (who’d also listed “cicada” on his top 10 albums of 2017 alongside friends like Amber Rubarth and bigger name albums produced by Ani Difranco), writes "rob steers the band through uncharted territory... [though] rob has honed and owned aggressive syncopated rapid harmony folk… it's cool to hear the album start with something cinematic and unsettling [Georgetown] or break into something reggae-influenced [Common]... for those familiar with the group this is an evolutionary album like you haven't heard before." Rowan adds didgeridoo drone to "Georgetown" and "Spring." Kristen breaks out her steel drums on the aforementioned "Common," and even sneaks in an accordion track on "Ode To a Heat Vent." rob adds baritone guitar, fretless bass and banjo. Notable special guests include Baltimore rapper & beatboxer Chuck The Madd Ox on "Spring," Steve Smith's mandolin on "Ode To a Heat Vent," Artem Bank's electronic percussion and literal heartbeat on "Secret Surgery," and Mosno Al-Moseeki's djembe on "Georgetown." From a fan (Liam G.): "This...is a masterpiece! I don't care what genre(s) you feel yourself anchored to; THIS will pull at your heart strings and set you aflame. Across its tracks it makes me dance like a fool, feel empowered, and thumb away tears from soaking up the passion they've poured into this record. Some songs I've loved for years and some stunning new gems. Do yourself a favor, dive right in."